There was also some pseudo-heraldry in downtown Lufkin, Texas. 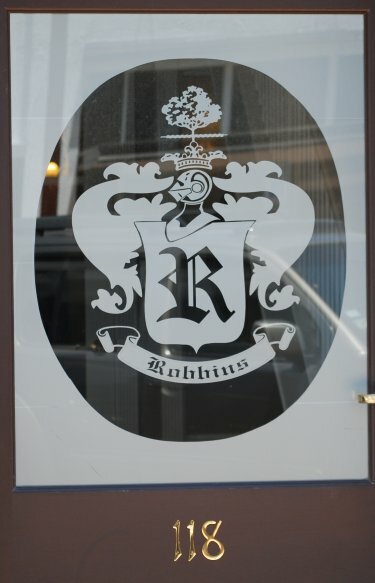 In this case, it was the coat of arms-like logo of the Law Office of Paul A. Robbins. The crest here (above the helmet) reminds me of nothing quite so much as the crest of the Dukes of Hamilton (below), a saw cutting through the trunk of a tree issuant from a crest coronet. The tree seems to be a oak tree. Yes, the tree in the Hamilton crest is an oak tree, but I don't see any acorns in the crest on the arms-like logo of the law office (not even on the higher resolution photo), so I was hesitant to identify it as an oak tree.